I’ve always had a soft spot for the Beastmen, now Total War: Warhammer’s latest faction, even when I got one stuck to my elbow thanks to what must have been the strongest glue known to man. While their fellow followers of Chaos, the aptly named Chaos Warriors, stick spikes to everything and hang around at death metal concerts, the Beastmen throw bacchanalias, orgies of blood and booze, and that’s definitely more my speed. 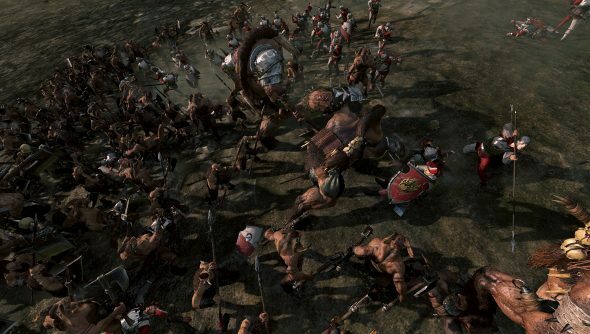 The Call of the Beastmen DLC introduces both the faction for use in the grand campaign, and a new, focussed campaign that pits the cloven-hoofed party-lovers against the Empire in a war where there’s very little faffing and lots of lovely battles. Looking for more brilliant PC strategy games? Try our selection. The Beastmen have, like all the other factions, unique units and abilities, but they’re really an amalgam of the Chaos Warriors and Greenskins. Like the former, they are a horde faction, never settling, carrying their buildings on their backs whenever they up sticks and move on. And wherever they go they bring Chaos corruption with them, inspiring rebellions and warping the land around them. Since they worship the gods of Chaos, they get to summon Chaos Spawn and Warhounds, too, spicing up their armies’ mix of units. But like the Orcs, the Beastmen can travel through secret routes to get to locations faster and set up dastardly ambushes. While the Greenskins can march underground, their hairier counterparts take hidden paths through the abundant forests of the Empire. And as they fight their rage increases, which leads to the spawning of new armies that can be directed at enemies. It’s very similar to the Greenskin Waaagh! system. None of this equates to the faction feeling overly familiar, however. The Beastmen are not copies; rather the pre-existing systems have been bundled together to create a faction as unique as any of the others. One of the most obvious differences is how multiple armies are handled. 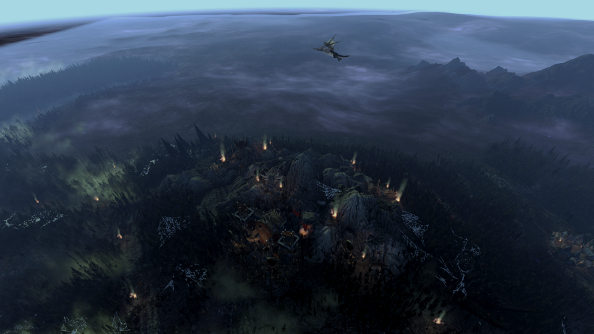 When two or more Greenskin or Chaos Warrior armies are close to each other, they suffer attrition due to infighting. The Beastmen might be aggressive and wild, but it turns out that they get along really well with each other, so you don’t have to worry about a herd of Gors picking a fight with a drunk Minotaur in the camp next door. Ok, so the Beastmen won’t pick fights with each other (unless they are in different factions), but what does that mean for your plans of conquest? A lot, actually. See, one of the Chaos Warriors’ biggest weaknesses is that, despite their strength, they often suffer a death from a thousand cuts, as multiple factions duke it out with the scattered Chaos forces. The Beastmen, on the other hand, can present a more united front, with armies working together to take on the really big targets. Another bonus is that this makes it easier to specialise armies, knowing that they’ll have backup shoring up any gaps in their unit variety. Since they’re a roving horde of conquerors, diplomacy takes a back seat, along with the game’s economy, as the Beastmen earn cash by raiding and looting, inspiring an ultra-aggressive strategy to keep the coffers full and the rage meter up. Sure, that means that playing as the Beastmen is less complicated than the majority of other factions, aside from the Chaos Warriors, but relegating two of the game’s weakest elements to a minor concern does wonders for the flow of the campaign. It’s in the new campaign, An Eye For An Eye, that the Beastmen really shine though. It’s narrower of focus and smaller in scale, but that plays to the strengths of the faction. A quest to conquer the Empire is what fuels the war, with the mobile Beastmen horde completely surrounded by various human factions and only the occasional neutral group of Orcs. Battles are frequent and war is constant, and there are very few times when waiting around is required or remotely helpful. Indeed, one of the few times I decided to stay in one place for longer than a couple of turns, I almost lost the campaign. I blame the moon. Morrslieb, the Chaos Moon, to be precise. When it’s full, an event pops up revealing four rites that can be performed, each conferring a boon. For a price. In this case, the price was no reinforcements for three turns. I had a full, healthy stack of Gors, Ungors, Minotaurs, Chaos Spawn and even a wonderful Cygor, a giant cyclopean bloke and versatile artillery unit who can pummel the enemies from a distance or squash them up close, so I was confident that the cost was worth paying. Next turn I was attacked. A decisive victory was the result, but I needed reinforcements. Damn that moon. I decided to stick around, raiding, for a few turns until I could fill up the ranks once again, and apparently also stick up a giant neon sign that read ‘Injured Beastmen here’ because straight away two full armies appeared. I fought that battle three times before I finally won. The problem wasn’t merely that both armies were large and fresh, but that they also had more artillery than any single nation surely needs. And I had one big bloke with a rock. The first two fights taught me two important things: fire hurts and knights are bastards. Every time I tried to take out the cannons with my Warhounds, shiny metal gits on horses would be there like a flash, turning my wee dogs into paste. And with the cannons safe, they were free to melt the rest of my army. It took more than a few distractions (RIP Ungor warriors) and a lot of hopping between forested areas before I managed to send them packing. As battles go, it was as desperate as they come, and it’s stuck in my mind as one of the best, dirtiest, most horrifyingly close brawls I’ve enjoyed in the campaign. 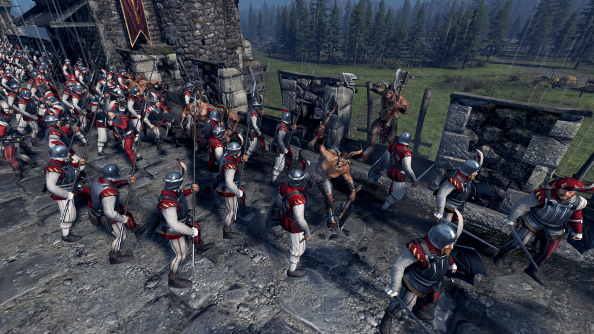 So while the moon rituals are just arbitrary stat-changing events, and temporary at that, they are often the catalyst for wrinkles that add a bit of texture to a campaign that otherwise might seem a little flat, thanks to its focus on total war. When it comes to spinning a yarn, however, the campaign doesn’t succeed nearly as well. It’s ostensibly driven by this story of Khazrak The One Eye’s quest to take on the Empire and kill his human nemesis, but this just equates to a dash of flavour text and quests that largely involve conquering and raiding. Given all the larger-than-life leaders rampaging across the map, and all the lore that Creative Assembly have at their fingertips, it continues to be a shame that story and characters aren’t lavished with the same attention given to unit design and the real-time battles. 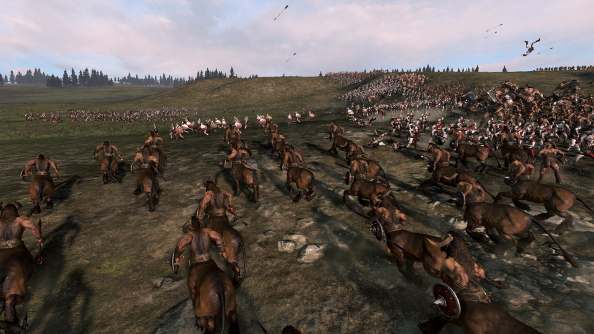 Call of the Beastmen strips away a lot of the busywork that bogs Total War: Warhammer down, evoking the halcyon days of Shogun 2. When it comes to tackling some of the issues of the core game it more often than not just throws a sheet over them, but this hairy, horny faction is a welcome addition to the roster, and the campaign a pleasant change of pace. Call of the Beastmen releases July 28 on Steamfor $17.09/£13.99. Those who pre-purchase will get 10% off.